Simply put, if you do not select the correct catalyst and correct conditions for ATRP, the reaction will not be controlled. Mechanistically, ATRP is based on an inner sphere electron transfer process, which involves a reversible (pseudo)halogen transfer between a dormant species (R-X) and a transition metal complex (Mtm/Ln) resulting in the formation of propagating radicals (R*) and the metal complex in the higher oxidation state (e.g. X-Mtm+1/Ln). Radicals react reversibly with oxidized metal complexes, X-Mtn+1/Ligand, in a deactivation reaction to reform the dormant species and the transition metal complex (Mtm/Ln) in the lower oxidation state, i.e. the activator. These processes occur with a rate constant of activation, kact, and deactivation kdeact, respectively. Polymer chains grow by the addition of monomers to the periodically generated radicals in a manner similar to a conventional radical polymerization, with the rate constant of propagation, kp. 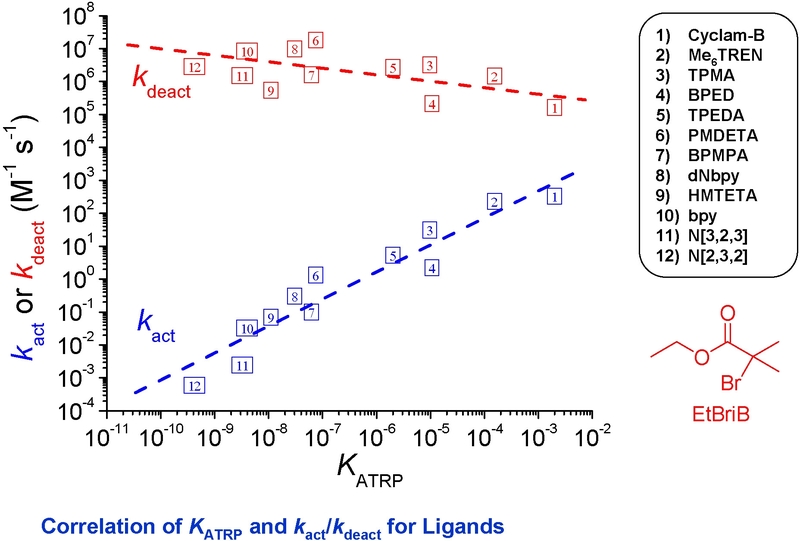 Termination reactions (kt) also occur in ATRP, mainly through radical coupling and disproportionation. The rate of polymerization is ultimately governed by the position of the ATRP equilibrium, as illustrated in equation (1) for a particular monomer, M.
Quantifying KATRP for a given catalyst therefore provides an excellent measure of the catalyst's true activity in a polymerization reaction. (5) The ligand L dramatically affects the values of both rate constants, kact(6) and kdeact,(4) and therefore their ratio, KATRP. (1) Shipp, D. A.; Matyjaszewski, K. Macromolecules 2000, 33, 1553-1559. (2) Pintauer, T.; McKenzie, B.; Matyjaszewski, K. ACS Symposium Series 2003, 854, 130-147. (3) Pintauer, T.; Braunecker, W.; Collange, E.; Poli, R.; Matyjaszewski, K. Macromolecules 2004, 37, 2679-2682. (4) Tang, W.; Kwak, Y.; Braunecker, W.; Tsarevsky, N. V.; Coote, M. L.; Matyjaszewski, K. J. Am. Chem. Soc. 2008, 130, 10702-10713. (5) Tang, W.; Tsarevsky, N. V.; Matyjaszewski, K. Journal of the American Chemical Society 2006, 128, 1598-1604. (6) Tang, W.; Matyjaszewski, K. Macromolecules 2006, 39, 4953-4959. (7) Matyjaszewski, K. Macromol. Symp. 1996, 111, 47-61. (8) Matyjaszewski, K.; Wei, M.; Xia, J.; Gaynor, S. G. Macromol. Chem. Phys. 1998, 199, 2289-2292. (9) Zhang, H.; Klumperman, B.; Ming, W.; Fischer, H.; van der Linde, R. Macromolecules 2001, 34, 6169-6173. (10) Matyjaszewski, K.; Nanda, A. K.; Tang, W. Macromolecules 2005, 38, 2015-2018. (11) Tang, W.; Nanda, A. K.; Matyjaszewski, K. Macromolecular Chemistry and Physics 2005, 206, 1171-1177. (12) Tsarevsky, N. V.; Braunecker, W. A.; Brooks, S. J.; Matyjaszewski, K. Macromolecules 2006, 39, 6817-6824. 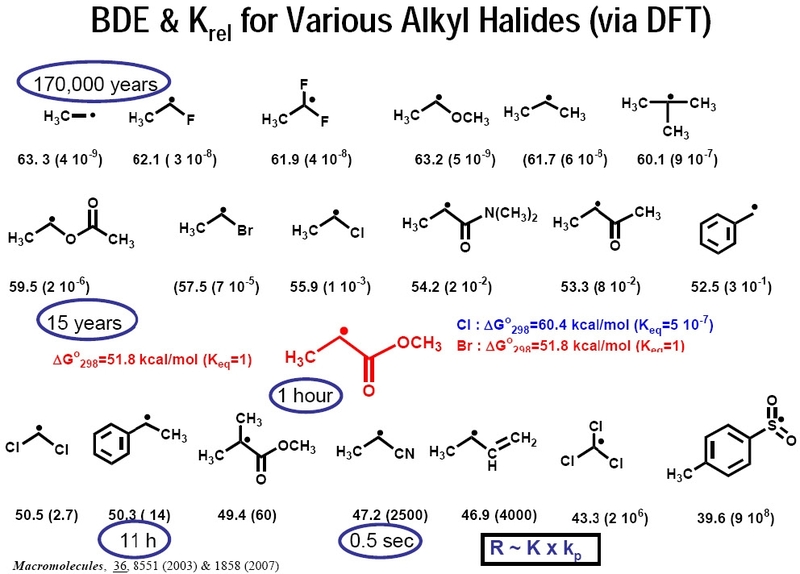 The ATRP equilibrium, (KATRP in the scheme above), is expressed as a combination of several contributing reversible reactions, including a combination of C-X bond homolysis of the alkyl halide (RX), (other transferable atoms or groups can participate in an ATRP(2) but the most frequently employed radically transferable atoms are halogens and will be used to exemplify ATRP throughout most of following discussions) two redox processes, and heterolytic cleavage of the CuII-X bond. 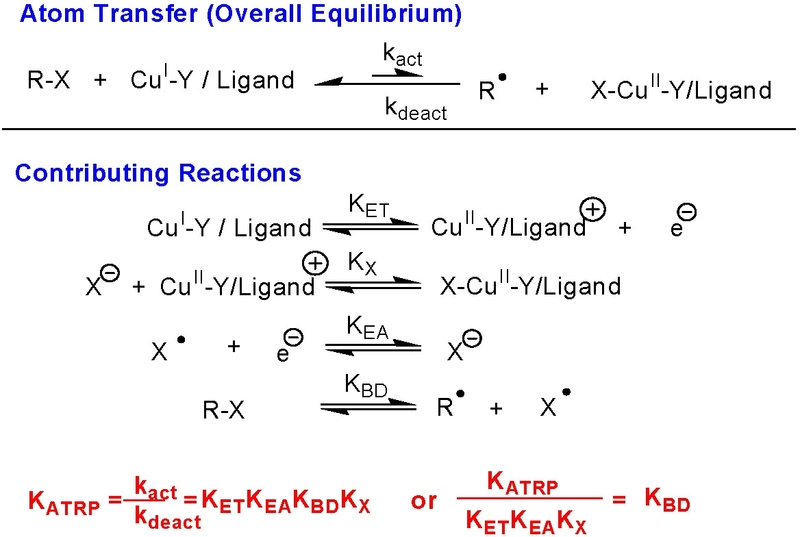 Therefore KATRP can be expressed as the product of the equilibrium constants for electron transfer between metal complexes (KET), electron affinity of the halogen (KEA), bond dissociation energy of the alkyl halide (KBD) and the equilibrium constant for the heterolytic cleavage of the Mtn+1-X bond (KX), which we have named the "halidophilicity" of the Mtn+1-X complex. 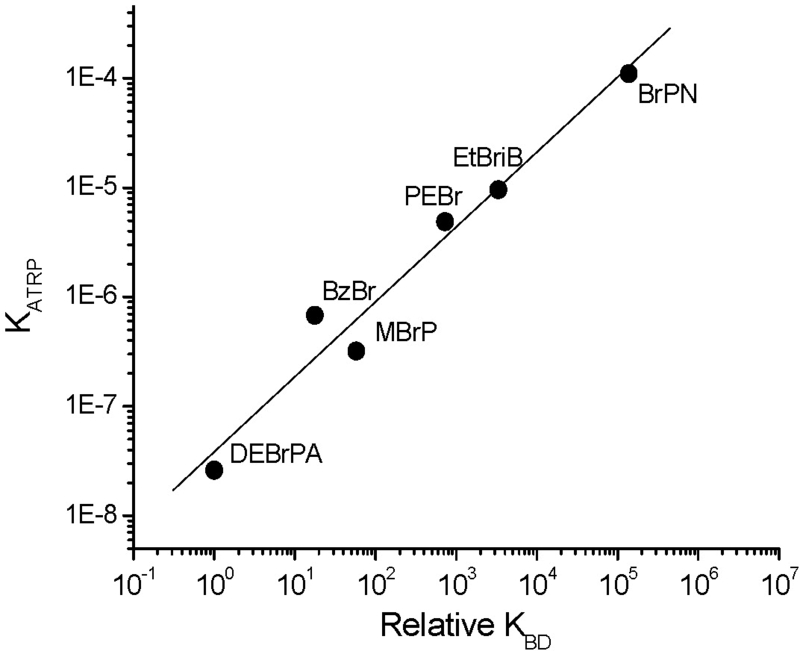 KATRP in the above plot was measured at 22 ºC with CuBr/TPMA; relative values of KBD determined from free energies calculated using DFT; BrPN = bromopropionitrile, BzBr = benzyl bromide, DEBrPA = N,N-Diethyl-α-bromopropionamide, EtBriB = ethyl 2-bromoisobutyrate, PEBr = 1-(bromoethyl)benzene, MBrP = methyl 2-bromopropionate. This calculation merely serves to demonstrate the necessity of choosing an appropriate catalyst for each monomer. This equation means that the rate of polymerization is controlled by the ratio of CuI to CuII and not the absolute amount of catalyst present in the reaction medium. Historically,(8) we considered that the persistent radical effect (PRE) was the primary contributor to the degree of control seen in ATRP and that the PRE operated with some differences between lower activity catalysts and high activity complexes. 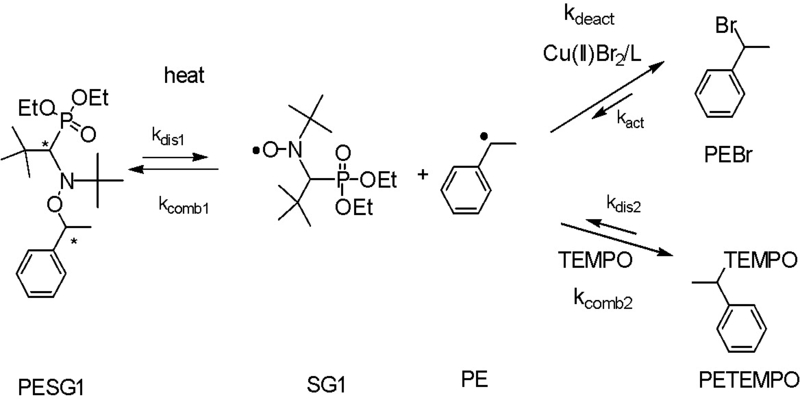 For example, when Klumperman and Fischer(9) examined polymerization of MMA in the presence of a copper complex formed with N-(n-hexyl)pyridylmethanimine the results showed that adding CuII to the initial reaction mixture can have strong effects on the kinetics of the ATRP depending on the [CuII]0/[CuI]0 ratio. 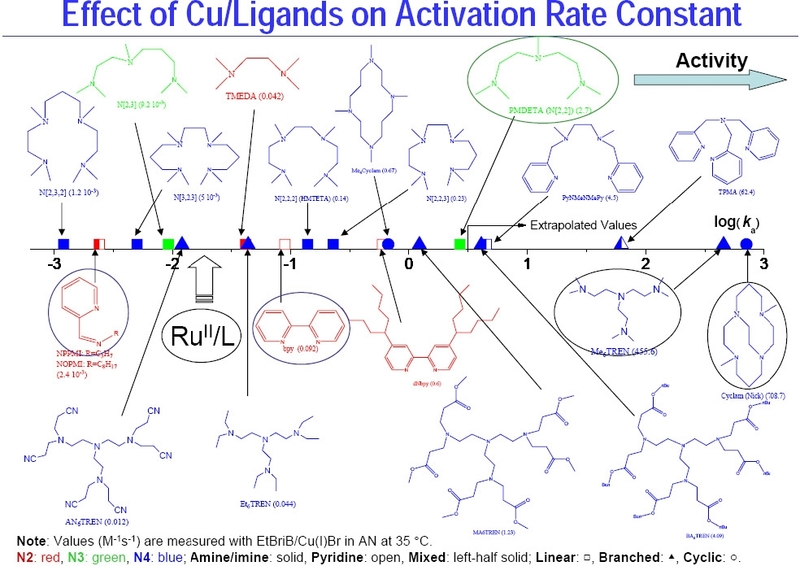 When 10% CuII relative to CuI was added at the beginning of the polymerization, the kinetics were described by Fischer's equation (where ln([M]0/[M]) varies with t2/3) with the reaction orders for initiator, Cu(I) and Cu(II), close to, or the same as, those in Fischer's equation, verifying the applicability of Fischer's equation in lower activity ATRP systems. On the other hand, when [CuII]0/[CuI]0 ≥ 0.1, the kinetics can be interpreted by Matyjaszewski's equation (ln([M]0/[M]) which varies with t). 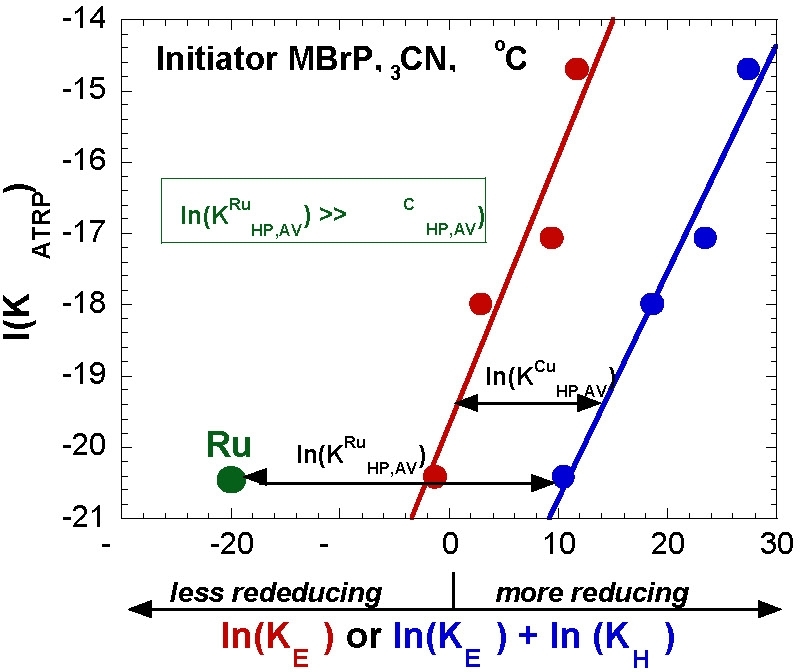 The polymerization rate almost shows first order kinetics with respect to the concentration of the initiator and CuI and inverse first order with respect to the concentration of CuII, suggesting that the "self-regulation" and radical termination becomes less important for the ATRP process when sufficient CuII is added at the beginning of the reaction. 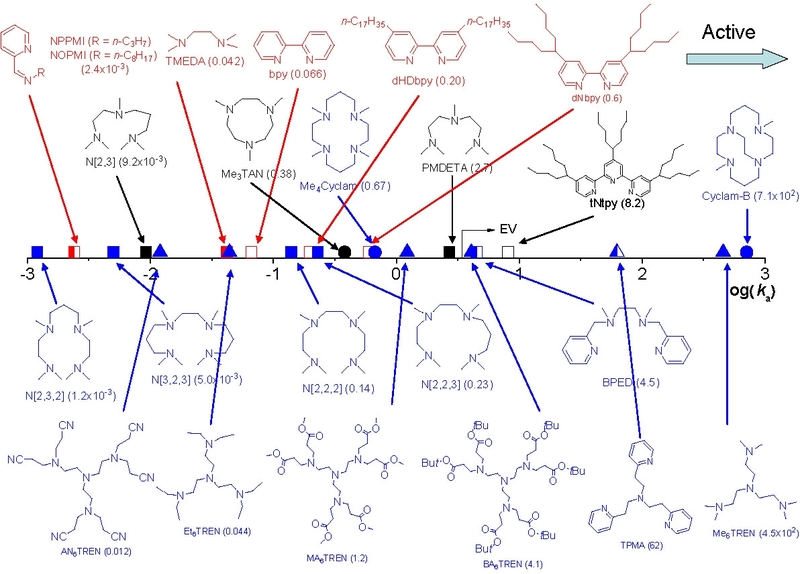 This result confirms the potential for better control of ATRP systems and possibility of reducing or eliminating "wastage" of initiator molecules undergoing coupling reactions to form the equivalent to the persistent radical in an ATRP. Typical values of the activation rate constants measured at 35 oC indicated that 2-bromoisobutyrate is approximately 10 times more reactive than the other alkyl halides and 1-phenylethyl bromide is ~20 times more reactive than the corresponding chloride. (3) This difference dramatically decreases at higher temperatures due to the higher activation energy for the latter. Deactivation rate constants were determined by trapping 1-phenylethyl radicals using TEMPO in a competitive clock reaction. The 1-phenylethyl radical was generated by the thermal decomposition of the 1-(N,N-(2-methylpropyl-1)-(1-diethylphosphono-2,2-dimethyl-propyl-1-)-N-oxyl)-1-phenylethane (PESG1). (12) The alkoxyamine can be obtained from Arkema under the trade name BlocBuilderTM and is one of the most versatile control agents available for NMP. Another method for the estimation of deactivation rate constants in ATRP using copper catalysts is based on the principle of reverse ATRP and is conducted under an air atmosphere, using molecular oxygen as an oxidant for the Cu(I) species. (14) The deactivation rate constants for several different reactive copper complexes were estimated by this procedure, and the results correlated with those obtained from the analysis of the evolution of molecular weight distribution with conversion and the results agreed well with competitive trapping reactions using nitroxides. (1) Braunecker, W. A.; Matyjaszewski, K. Progress in Polymer Science 2007, 32, 93-146. (2) Davis, K. A.; Matyjaszewski, K. Journal of Macromolecular Science, Pure and Applied Chemistry 2004, 41, 449-465. (3) Tang, W.; Matyjaszewski, K. Macromolecules 2007, 40, 1858-1863. (4) Tang, W.; Kwak, Y.; Braunecker, W.; Tsarevsky Nicolay, V.; Coote Michelle, L.; Matyjaszewski, K. J Am Chem Soc 2008, 130, 10702-10713. (5) Matyjaszewski, K.; Nanda, A. K.; Tang, W. Macromolecules 2005, 38, 2015-2018. (6) Knuehl, B.; Pintauer, T.; Kajiwara, A.; Fischer, H.; Matyjaszewski, K. Macromolecules 2003, 36, 8291-8296. (7) Pintauer, T.; Braunecker, W.; Collange, E.; Poli, R.; Matyjaszewski, K. Macromolecules 2004, 37, 2679-2682. (10) Tang, W.; Tsarevsky, N. V.; Matyjaszewski, K. Journal of the American Chemical Society 2006, 128, 1598-1604. (11) Matyjaszewski, K.; Goebelt, B.; Paik, H.-j. ; Horwitz, C. P. Macromolecules 2001, 34, 430-440. (12) Matyjaszewski, K.; Paik, H.-j. ; Zhou, P.; Diamanti, S. J. Macromolecules 2001, 34, 5125-5131. (13) Tang, W.; Kwak, Y.; Braunecker, W.; Tsarevsky, N. V.; Coote, M. L.; Matyjaszewski, K. J. Am. Chem. Soc. 2008, 130, 10702-10713. (14) Gromada, J.; Matyjaszewski, K. Macromolecules 2002, 35, 6167-6173. In this section of the page we discuss the role of the coordinating ligand in the catalyst complex and its effect on catalyst activity. We are interested in the redox behavior of copper complexes that could be used in an ATRP, and how the redox potential is dependent on the complex forming ligand and on the reaction media. Cyclic voltametry of copperI and copperII complexes are used to measure the redox potentials. For Cu(I) complexes with nitrogen based ligands KATRP is proportional to E1/2. More reducing catalysts increase KATRP. The redox potential and halidophilicity of the catalyst are affected by both the transition metal and ligand. Generally, the more reducing the catalyst complex is, the more active the catalyst. The order of activity is shown below for a selection of N-based ligands. The reduction potentials can be correlated with kact and kdeact for the activation of 1-PhEtBr and deactivation of PhEt·. The deactivation rate constants scale reciprocally with activation rate constants. The catalyst complex formed with Me6TREN has a very high kact AND a sufficiently high kdeact making Me6TREN a VERY efficient ligand, especially for less reactive monomers. and Me6TREN is available from ATRP Solutions. 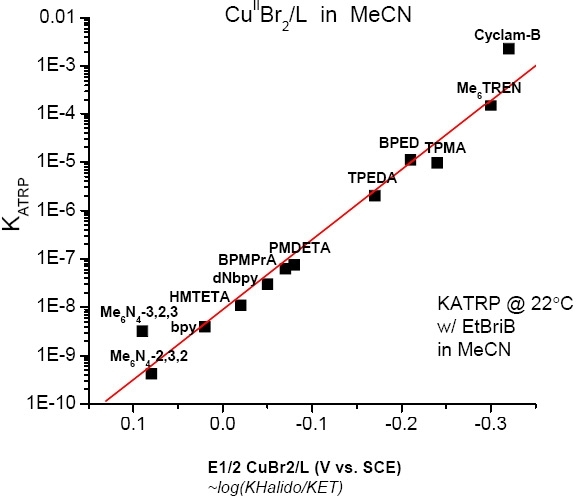 The most active ATRP catalyst reported to date, the Cu complex dimethyl cross-bridged cyclam,(5) was identified solely based on its very low reduction potential (> 75 mV lower than that of the CuBr /Me6TREN complex). The range of activity of catalyst complexes with different ligands therefore exceeds one million. This figure clearly indicates that conditions optimized for one catalyst complex, e.g. a pyridine-imine (NPPMI) based catalyst complex, can not be used for complexes employing Me6TREN as ligand or indeed even bpy, since the activity between the complexes differ by orders of magnitude. These differences do not indicate different polymerization mechanisms are operating, only that the reactions conditions have to be modified to take into account the different activity of the selected catalyst complex. The general order of activities of Cu complexes is related to their structure and follows the following order: tetradentate (cyclic-bridged) > tetradentate (branched) > tetradentate (cyclic) > tridentate > tetradentate (linear) > bidentate ligands. The nature of the N atom is also important and follows the order: pyridine ≥ aliphatic amine > imine. The link between the N-atoms is also important with C2 > C3 >> C4. As seen from the above figure the activity of a given Cu complex strongly depends on the ligand structure and even small structural changes may lead to large differences in their activity. Note effect of different substituents on the activity of TREN-based ligands. In addition to changing the phylicity of the resulting complex the different substituents dramatically change the activity, resulting in formation of catalyst complexes with activity spanning 5 orders of magnitude, from the lower activity of AN6TREN to high activity with Me6TREN. Recently a new, versatile and highly active copper-based complex CuBr/N,N,N',N'-tetrakis(2-pyridylmethyl)ethylenediamine (TPEN) was reported for ATRP of acrylic, methacrylic, and styrenic monomers. (6) The catalyst mediated ATRP at a catalyst/initiator molar ratio of 0.005 and produced polymers with well-controlled molecular weight and low polydispersity. ATRP occurred even at a catalyst/initiator molar ratio as low as 0.001; i.e., with copper concentration in the produced polymers as low as 6-8 ppm, (catalyst/monomer molar ratio = 105). The catalyst structures were studied by X-ray diffraction and NMR spectroscopy. The activator CuIBr/TPEN existed in solution as an equilibrium mixture of binuclear and mononuclear complexes but as a binuclear complex in single crystals. The deactivator CuIIBr2/TPEN complex was mononuclear. High stability and appropriate KATRP were found crucial for catalysts required to work under high dilution or in the presence of coordinating solvents/monomers. 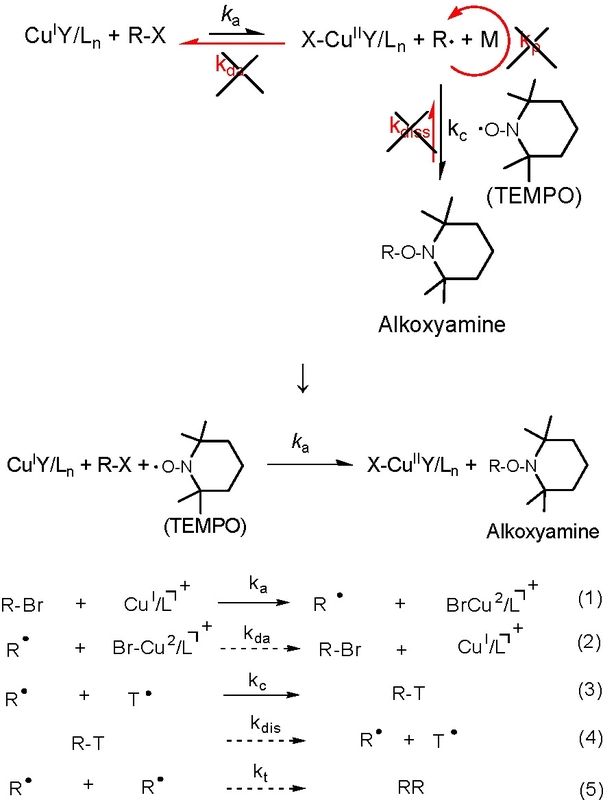 This provides guidance for further design of highly active ATRP catalysts. (1) Becker, M.; Heinemann, F. W.; Schindler, S. Chem.--Eur. J. 1999, 5, 3124-3129. (2) Di Vaira, M.; Orioli, P. Acta Crystallogr., Sect. B 1968, 24, 595-599. (3) Gromada, J.; Spanswick, J.; Matyjaszewski, K. Macromolecular Chemistry and Physics 2004, 205, 551-566. (4) Tang, W.; Matyjaszewski, K. Macromolecules 2006, 39, 4953-4959. 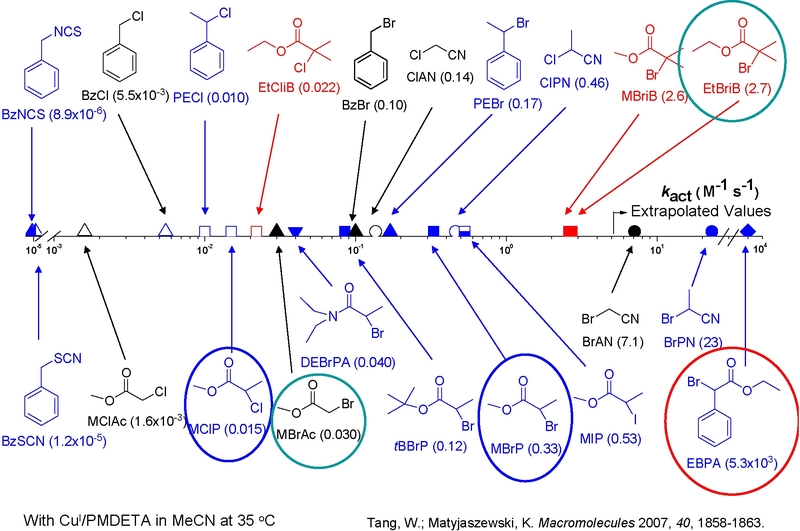 (5) Tsarevsky, N. V.; Braunecker, W. A.; Tang, W.; Brooks, S. J.; Matyjaszewski, K.; Weisman, G. R.; Wong, E. H. Journal of Molecular Catalysis A: Chemical 2006, 257, 132-140. 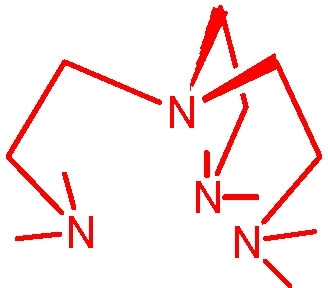 (6) Tang, H.; Arulsamy, N.; Radosz, M.; Shen, Y.; Tsarevsky, N. V.; Braunecker, W. A.; Tang, W.; Matyjaszewski, K. Journal of the American Chemical Society 2006, 128, 16277-16285.